14 Şubat 2019 Perşembe 13:01 - 6 reads. In a rare coordinated campaign has uighurs who fled China have gone out by requiring proof that their relatives live. 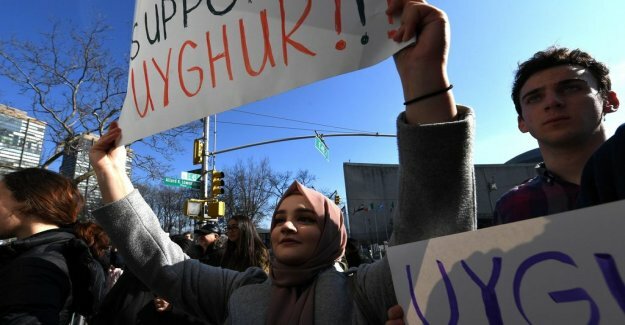 The petition, which goes under the hashtagen #MeTooUyghur on Twitter came after Turkey in unusually harsh terms criticised China for its treatment of the uighurs, the muslim population in the region of Xinjiang. China's actions are a ”great shame for the mankind”, stated the Turkish foreign ministry in a statement to the country for the first time publicly criticised China on the issue. Turkey also demanded that China closes the camp where an estimated one million uighurs have been camps which, according to the China aims to train and facilitate for the uighurs to get jobs, but according to those who have fled the camps are clean concentration camps where they are forced to take distance from their faith, and swear loyalty to the communist party. Those who have refused have been punished by been forced to eat pork or drink alcohol, some have a clause in solitary confinement and there have also been reports of torture. pointed out that there have been acts of terrorism in the province and that it is important to counter fundamentalist tendencies. Turkey's condemnation came after data on to the popular uyghur musician Abdurehim Heyit should have died in one of these camps, after being subjected to torture. It was denied shortly thereafter by China as an ”absurd lie”. As evidence published a video where Abdurehim Heyit says that he is in good health. According to chinese authorities, he has detained under suspicion for being a danger to national security. the Video's veracity has been questioned by some uighurs. But it was the start of the movement where the uighurs outside of China ask the regime about the signs of life from their relatives. On social media seen the uighurs where they keep the photographs of parents, children and siblings and ask: where are they?, they live for? They want to have proof. ”China's authorities show a video as evidence that the Heyit live. Live the millions deprived of their liberty also?, write Halmurat Harri, uygur in Finland who started the petition. is Muhammad Atawulla asking the chinese regime was his mother and two brothers are, how they feel, if they live or are dead. ”What happened with my family?? ?”, writes Muhammad Atawulla in a post. Also, Alfred would like to have proof that his parents are alive, he writes that it has been 15 months since his mother was taken away to a concentration camp, and eleven months since his father disappeared. living with constant anxiety over what has happened to their relatives. Many times they are hard to get contact because the uighurs who remain in Xinjiang are afraid that they will misstänkliggöras if they are communicating with someone abroad. Therefore, blocking the their relatives living abroad in the social media. But some answers from the chinese authorities seem to not get as a result of the campaign. – China has over 1 billion inhabitants, we need to drop a video to every single one, asked a spokesperson for the department of state at a press briefing on Tuesday.